I am very grateful to have studied with Yogi Bhajan for about 35 years, and grateful that I am able to continue to practice and grow on this path. Kundalini Yoga and Meditation is such a great tool to share with people in these difficult times. Currently I participate in Aquarian Teacher Training programs in Herndon, VA at Darshan Yoga Studio (http://kundalini-yoga.us/teacher.html), and in Charlottesville, VA at Breathe Studio (http://www.aplacetobreathe.com/teachertraining.html). Sat Nam Rasayan courses, taught by Gurudev Singh Khalsa, have also strengthened my skills greatly, and give me a greater ability to share Yogi Bhajan's wonderful teachings with others. RaviInder brings to her teaching all of the aspects she has lived and practiced for over 35 years, including yogic diet & lifestyle, yoga for health and healing, the yoga of relationships, prenatal and postpartum care, conscious parenting, and Radiant Woman workshops, integrating the vast teachings of Kundalini Yoga as taught by Yogi Bhajan. She had the privilege to study at the feet of her Teacher beginning in 1975; attending Solstice retreats, Ladies Camps, White Tantric Yoga courses, lectures and workshops; immersing herself in the experiences of the Teachings. Over the years, RaviInder has shared her love of Kundalini Yoga with hundreds of people from all walks of life. She has taught publicly in Ashrams, Health Clubs, Yoga Studios, Community Centers, high schools & colleges, and the federal government. In day to day interactions, she strives to help people live their best life. 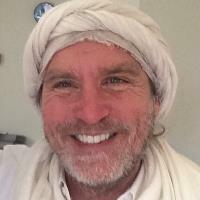 Sat Kartar Singh is a dynamic, patient, inspiring teacher who has been sharing the technology of Kundalini Yoga and the 3HO lifestyle for over 40 years. Born in the 50’s and influenced by the events of the 60’s, Sat Kartar Singh met Yogi Bhajan, Master of Kundalini Yoga in 1974. Immediately inspired by this funny, loving, and blunt teacher, He began to study with “Yogi Ji”. Sat Kartar Singh brings to his teaching all of the aspects he has lived and practiced for many years. This includes Yogic Lifestyle, Naad Yoga- the yoga of mantra and sound, Yogic and Western Anatomy as well as the vast teachings of Kundalini Kriyas & Meditations. Sat Kartar Singh is a touring member of the GuruGanesha Band. He has a thriving teaching practice in Alexandria VA, and teaches Level 1 in Alexandria,VA and Miami, FL. Masuda/Sat Meher is the founder and director of Radiance Yoga studio in Alexandria, Virginia. In her classes, Masuda creates a warm and inviting space for students to relax, laugh, expand their awareness, discover their power, and connect with their creative essence. She finds yoga to be a powerful tool in experiencing peace, healing, and transformation. Masuda leads workshops and retreats around the world on Kundalini Yoga, Meditation and the Chakras. Masuda is a Professional Level Kundalini Yoga Teacher Trainer and 500-hour level RYT. She first discovered Kundalini Yoga while teaching writing and outdoor living skills at the Mountain Institute in West Virginia in 2002. She became devoted to the practice and finished her first teacher training in 2004. She also completed her prenatal teacher training at Golden Bridge yoga center in New York. 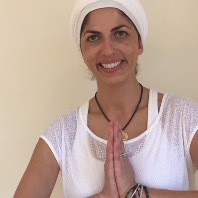 Yogi Bhajan, master of Kundalini Yoga, gave her the spiritual name Sat Meher Kaur which means “True Blessing and True Compassion.” Masuda holds a Master’s degree in Creative Writing and a Bachelor’s degree in Philosophy, both from George Mason University. She has been published in The Washington Post Magazine and featured in National Geographic Magazine.